RVsWithoutBorders.org is a matching platform for RV users, RV donors and lenders and home hosts for RV placement. TipsFromSurvivors.org is a partner website with an RV Guide which is part of a larger publication for tips for be more resilient. Our goal is to reduce demand on our existing housing stock (and resulting price increases that few can truly afford). We do not charge for what we do on this website. We are raising community, not money! Whether we assist you directly or not, the guidance provided here can help ANYONE who wants to use an RV as a temporary dwelling unit. We hope our assistance takes stress off the housing supply and pricing, while the market adjusts. This also helps the survivors rest and thrive during this difficult transition. We’ve been THERE. We understand. Using RVs to solve the incredibly severe housing shortage caused by the destruction of housing units and the tens of thousands of visiting contractors. RVs are a great asset to the community, as there is no alternative to RVs that can get there fast enough. If you have an RV, please help by loaning or donating it. 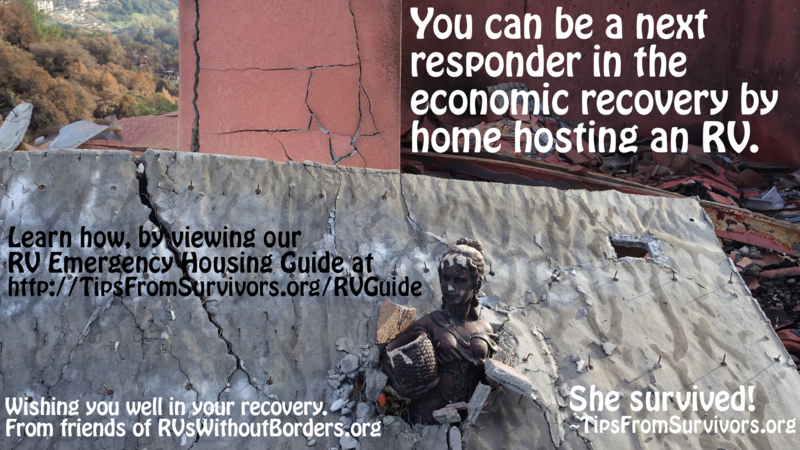 Home owners are our next responders and can be heroes in the economic recovery by home-hosting an RV. This benefits not only displaced residents and visiting contractors, but EVERYONE needing housing in the disaster zone. Contractors that will far outnumber the people displaced and we need to give them opportunities so they don’t use our precious housing stock needed for long term residents! If you want to know what your local municipality allows, visit here. 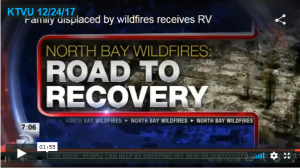 If you have a home in Mendocino, Sonoma, Napa, Ventura or Santa Barbara, you may be able to host an RV, please visit here. If you have insurance coverage for loss of use while rebuilding or can afford to rent at RV at market rates, please visit here. If you were an uninsured homeowner or renter and need temporary housing at a reduced rate, register here. If you would like to permanently donate an RV thru RVsWithoutBorders and receive a donation letter for tax deduction, click here. If you would like to loan your RV at a charitable rate thru our collaboration with Mighway, please visit here. If you would like to rent your RV at market rate to insured individuals and relief workers through Mighway, please visit here.